A follow-up book to Teaching Little Fingers to Play. Willis. Learn To Play. Instructional book (softcover). With introductory text, instructional text, illustrations, easy piano notation, fingerings and lyrics (on most songs). 32 pages. Willis Music #11995E. Published by Willis Music (HL.406137). The purpose of this book is to strengthen the skills introduced in John Thompson's Teaching Little Fingers To Play, thereby making the transition to the First Grade Book a comfortable one. 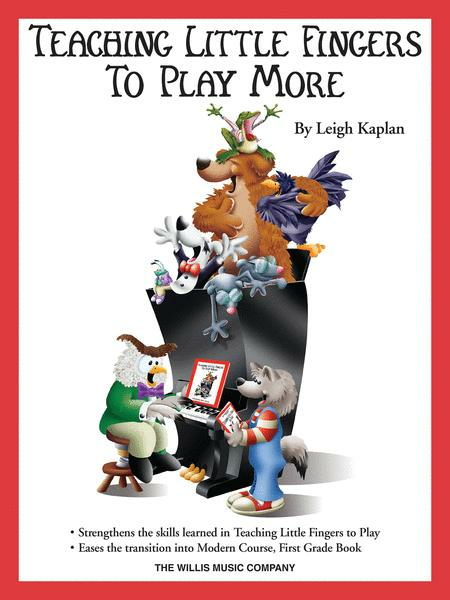 Excellent arrangements and adorable four-color illustrations throughout will make this a favorite of teachers and students alike. too advanced for a beginner. My students became pretty frustrated with the counting of notes and not without reason. The melodies of this book are lovely, but the book is not for a beginner, and I haven't figured where I would put it in my teaching of students. 35 of 64 people found this review helpful. May 26, 2007 To Much to Fast. I had already purchased this product. However, my teacher said she usually doesn't use it because it goes into much detail withouth explanation. himself.) Whenever I have put a student into Teaching Little Fingers to Play More right after they completed Teaching Little Fingers to Play, their playing and motivation went downhill. Now as a second book I give them John Thompson's Easiest Piano Course Book 2 instead. 31 of 56 people found this review helpful.